Over recent months I have been working on a major new resource for those interested in the emigrant experience of the American Civil War. It seeks to provide information on all the widows and dependents receiving American pensions outside the United States, based on those listed in the 1883 List of Pensioners on the Roll. The first element of this project has now been completed and is made available here. It deals with widows and dependent parents who were in receipt of monies on mainland Europe, principally as a result of a loved one’s service in the American Civil War. Future additions to the project will include the UK & Ireland, the Americas (excluding the United States) and the Rest of the World. Ultimately it will constitute a detailed freely accessible resource on all 1883 American military pensioners everywhere outside of the U.S. I am eager for this resource to be of maximum use to prospective researchers, and as such the excel files I have created for have been freely provided for download below. For ease of use I have also mapped the results, creating an interactive resource on Google Fusion Tables so that readers can spatially explore the pensioners in a European context and also with respect to the locations in the United States where their loved ones died. I would like readers feedback on this project, so if you have any suggestions for corrections, additions or improvements please let me know. As outlined above, the baseline data for this project has come from the 1883 List of Pensioners on the Roll, which was created at the direction of Congress in order to ascertain the details of American military pensioners then in receipt of Federal monies. The list contained details on the pension certificate number, the pensioner name, their postal location, the reason for their pension, its monthly value, and the date from which it was approved (see Figure 1 below). As my principal area of interest is in dependent pensioners, I am only seeking to map them as part of this project- pensioned former servicemen have therefore been excluded. Having first exported the information from the List of Pensioners into an excel spreadsheet, I sought to identify gaps or errors in the data. This most commonly arises from mis-spelling of the pensioners name, mis-spelling of their postal address, and occasionally mis-assignation to an incorrect region. In order to increase the functionality and usefulness of the dataset, I next conducted extensive research in pension files, pension indexes, regimental muster rolls and regimental rosters to add three further layers of information, namely the name of the serviceman on whom the pension was based, his unit, and his fate. In addition I added grid-coordinates for both the location of the pensioner in their home country, and also the site associated with their loved one’s death. The results allow for a range of different types of analysis of the data, which allow us to both ask and formulate different questions about these pensioners. 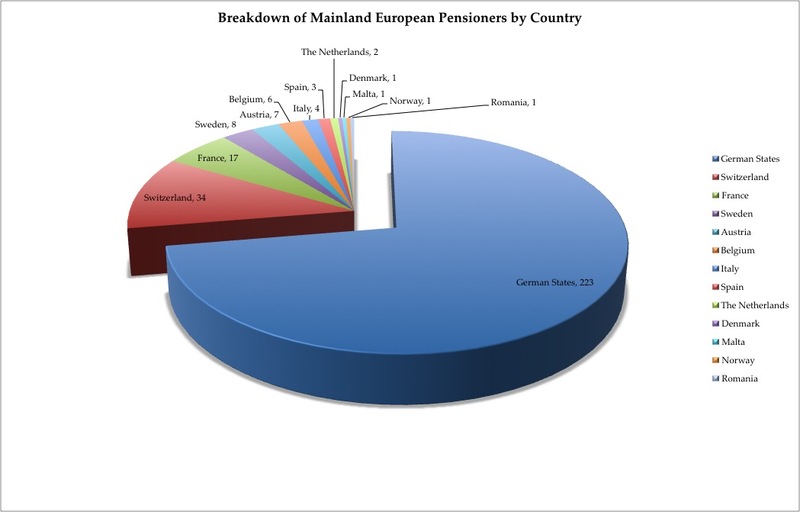 In this first data and mapping instalment, I have covered all those pensioners listed on mainland Europe, together with those who were recorded as having ‘Unknown’ locations, the majority of whom were also from the 19th Century German States. Readers should be aware that the geography of Europe has changed substantially since the 1883 list was prepared, and as a result, the homes of pensioners which were once part of the German States or the Austro-Hungarian Empire now form part of different countries, and some have undergone an official name change.In some instances I have found information within pension files or through other research which have led me to correct or interpret information provided on the List of Pensioners, and users will be able to identify this in the data through the use of parentheses (). Another way of looking at the information relates to examining the death locations of the men on whom the pensions were based. 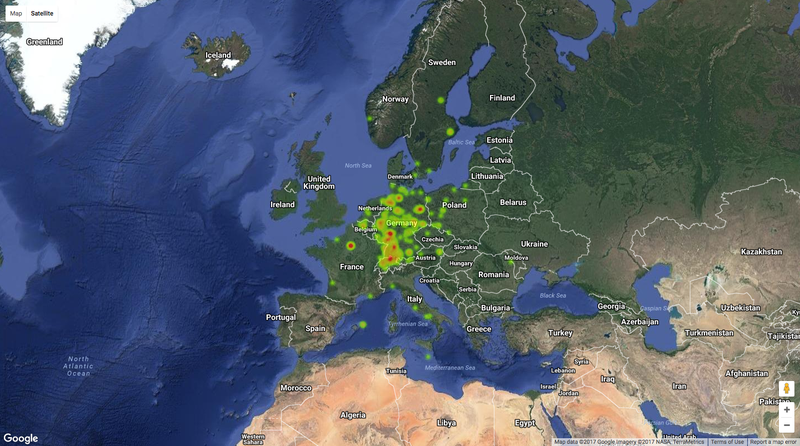 Figure 3 records this data, looking at each location among the mainland Europe group where place of death was identifiable, and which registered three or more dead. Figure 3. 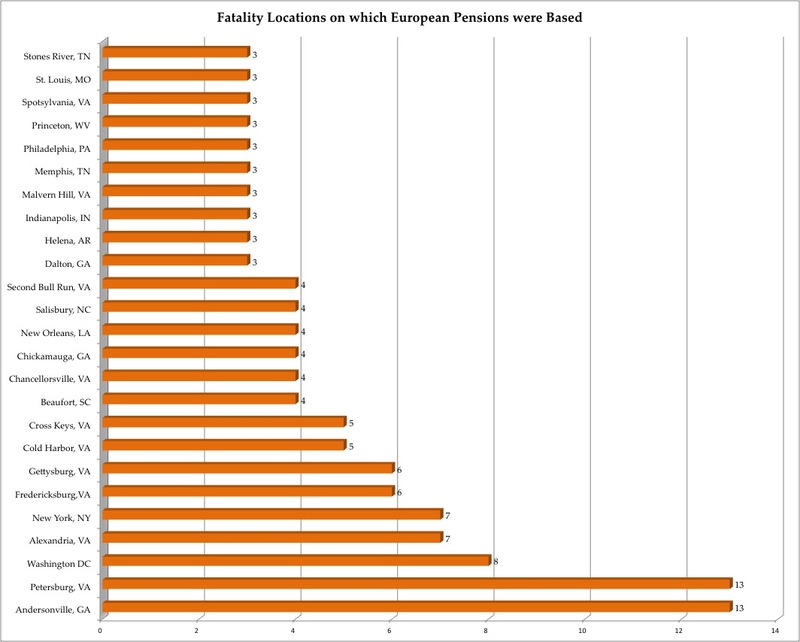 Known locations where men died and on which Mainland European pensions were based. Only those with 3 and above deaths are represented on the chart. For the purposes of this representation all New York harbour military installations were amalgamated with New York, while all battles of the Petersburg Campaign were amalgamated with Petersburg (Click image to enlarge). Readily apparent is the toll that prison camps, most notably Andersonville, took on Mainland European-born troops. It is also interesting to note the relative impact of different engagements when it comes to this dataset. Battles that are not among the most celebrated during the conflict, for example Cross Keys and Princeton, are prominent on this table, while others such as Antietam (where I recorded two deaths) are not. Indeed, Cross Keys is equivalent in impact to Chancellorsville on the reasons behind the pension claims, despite the fact that the latter engagement is viewed as the most disastrous with respect to German participation in the conflict. Gathering data in this fashion on both sides of the Atlantic also allows us to seek to visualise data in different ways. The map in Figure 4 uses the Palladio Visualization Tool (developed at Stanford) to connect the areas in Mainland Europe where pensions were being claimed with the Confederate prison locations where their loved one’s died. Locations in Mainland Europe where pensions were claimed based on deaths in Confederate prison camps. Andersonville, Georgia dominates. Visualized using Palladio (Click to enlarge). It is also possible to examine the data from the perspective of State of affiliation (Figure 5). New York is overwhelmingly dominant, with almost four times as many associations with Mainland European pensioners when compared to any other State. Unsurprisingly given their German populations, Ohio, Pennsylvania, Illinois and Missouri also figure strongly. Figure 5. The States/Affiliations of the identified units in which men served and on which Mainland European pensions were based. It includes the United States Regulars and United States Navy (Click image to enlarge). I am aware that many readers will be eager to discover what specific military units are connected with the dataset; with that mind, at the bottom of this post is a full listing, in numerical order, of all the units I was able to identify and the number of servicemen associated with each (Table 1). As alluded to above, the main interface for this resource is through the mapping of the pensioners, which was carried out using Google Fusion Tables. Four maps have been produced, two location maps which identify the sites in Europe and the United States where pensioners were based and the servicemen died, and two heatmaps which identify relative concentrations of sites in Europe and the U.S. The latter are particular interesting for identifying regions within Germany where pensioners were at their densest. In order to utilise the location maps, click on the images below to go to map, and zoom in to specific area to explore the material. You can click your mouse over a point to see the information on the pensioner and their loved one’s service and fate. The information you can access for each datapoint can be seen in Figure 6 below. Figure 6. The details you will be able to access with each datapoint on the map. This particular example relates to Johanna Lonntz, whose son Gustav died with the 7th Cavalry at the Battle of the Little Bighorn. It is also worth noting that in order to see all the datapoints in areas of high concentrations (e.g. cities such as Berlin and Paris) you will need to zoom right into that location, as the points are closely spaced. Hopefully there will be information of interest to a wide range of users. Keep an eye out for some of my favourite pensioners in this group, the wealthy American widows who were claiming their pensions while presumably on European tours in France and Italy. Although I sought to identify as many locations and units as possible, inevitably there are a number I was unable to locate. I would be very interested in hearing from anyone who may have information they can add to this dataset in this regard, or if you have any corrections to offer. For those who wish to access the original excel spreadsheets, you can download the European datasheet here: European Dependent Pensions Mainland Europe: DATA-EUROPE and the American datasheet here: Europe Dependent Pensions Mainland Europe:DATA-USA. Finally, below is the table of military units identifiable for men on whom the Mainland European pensions were based. Table 1. 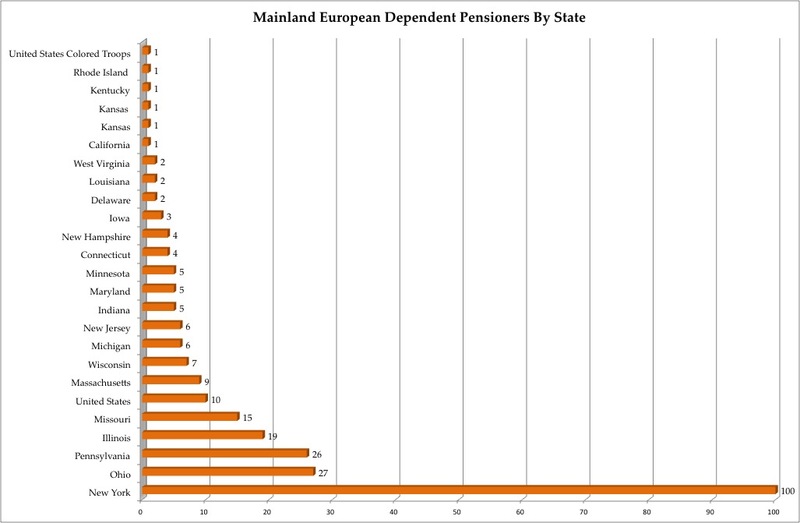 The identifiable units associated with the Mainland European pensions, in numerical order. This is all confusing to me, although you have given plenty of info to help me understand it. I will definitely be checking back when I start looking at the members of the 11th New York Fire Zouaves. You, good sir, are amazing! This is amazing Damian!! What a great set of research tools you’ve set up. Have you thought of explaining how to make these maps? Thanks! I must do that sometime, another post maybe! WOW! And I thought I was a data nerd! Thank you for all this work!